Situated in a rural setting alongside the beautiful Groynes resort and nestled in a picturesque garden is the Rosebank Estate. It offers a central location being only 6 kms from the airport. With the beautifully landscaped gardens and pond, the elegant sculptures and the rural backdrop, it is the ideal place to celebrate your wedding day and also provide great photo opportunities. Weddings can be staged indoors or outdoors depending on your preferences, from small intimate weddings to large groups of up to 200+ guests. The Gardens and even the small Chapel provide a feeling of openness and the beautiful roses and flowers always provide great photo opportunities in summer. We provide chairs, a signing table, outdoor sound system and a wedding arch if required. “Garden only” wedding typically only allowed on Saturday mornings or during week days. Outdoor weddings can be arranged in the gardens or in the little chapel which has been hand painted to create an intimate atmosphere. Large patio and spill-out areas are available for guests to relax or have drinks. Various indoors facilities are also available and this combined with the garden option provides “insurance” against inclement weather. 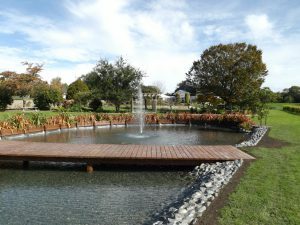 Rosebank has some of the best facilities available for weddings in Christchurch catering for small intimate weddings to even large groups of more than 200. The main Banquet room seats 120 guests, the Merlot Marquee another 120 (and these can be combined). The wine barrels, French trellises, lighting and high ceilings in the banquet room makes it easy to create the right atmosphere for a fantastic wedding reception or even the ceremony. It also includes a permanent dance floor where guests can enjoy themselves until late. More informal weddings can be arranged in the Merlot Marquee which can also accommodate up to 120 people. This is equipped with laser lighting for dancing as well as party lights to create a joyful atmosphere. Sound systems and a stage are available for hire. The Cabernet Cottage seats up to 40 and the Riesling Room up to 20 guests. Please see the section on “facilities” to get an idea of the beautiful rooms available or please make an appointment so we can show you around the property or come and view our Wedding Album to get some great ideas for your wedding. A Wedding and Events coordinator can be contacted on bookings@rosebank.co or 03 323 73 53 (or 323 9314 if experiencing difficulties).